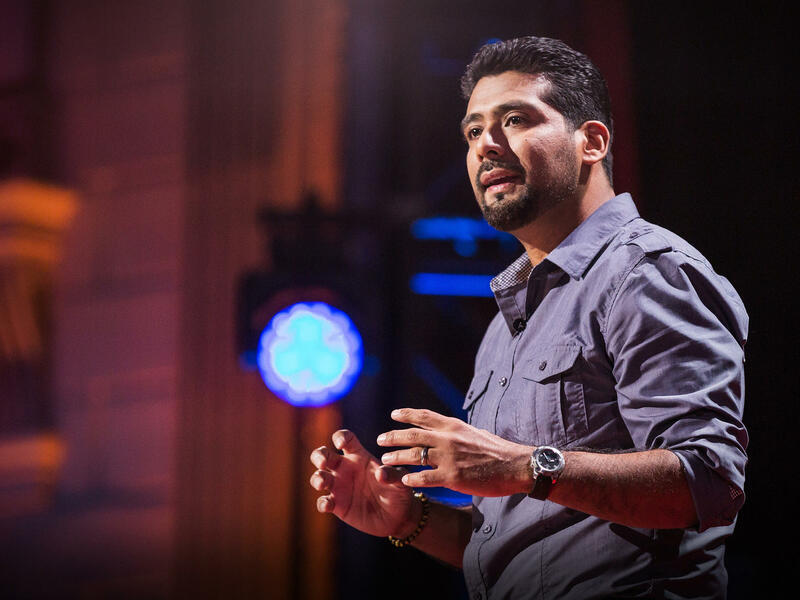 Victor Rios on the TED stage. It's the TED Radio Hour from NPR. I'm Guy Raz. And on the show today, Hidden Potential - ideas on recognizing the potential in people even when they can't picture it in themselves. VICTOR RIOS: By age 16, I would tell myself essentially I'm either going to end up dead or in prison. There's really no other option. RAZ: This is Victor Rios. Today he's a professor of sociology at UC Santa Barbara. RIOS: There was moments where I would stand on street corners, and there were guys that would drive by and shoot at us. And instead of running, I would stand there waiting for them - for the bullets to hit me because I didn't care. I didn't care about my life. RAZ: Can you tell me about where you grew up and how you grew up? RIOS: Yes. Well, I grew up in Oakland, Calif. And I didn't have a father. He abandoned us before I was born. And my mother was scraping by to make ends meet. I remember being a little kid, and we're at a park in Oakland. Calif. And it's a beautiful day. The sun is out. And we're having a great time, family time. And then it starts to get dark. And it starts to get cold. And I asked my mom, when are we going home? And she says to me, son, we're not going home. This is where we're sleeping tonight. And so being poor as a child, being homeless at times, not having a father, experiencing insurmountable amounts of violence - seeing, for example, my best friend shot and killed. So by the time I turned into a teenager, I was becoming a juvenile delinquent, dropping out of high school. And I didn't know who to turn to. But I had a teacher that cared for me dearly. And she would always tell me, Victor, when you're ready to change, I'll be here for you. RAZ: Here's Victor Rios on the TED stage. RIOS: But she understood one basic principle about young people like me. We're like oysters. We're only going to open up when we're ready. And if you're not there when we're ready, we're going to clam back up. Mrs. Russ was there for me. She respected my community, my people, my family. I told her a story about my uncle Ruben. He would take me to work with him because I was broke, and he knew I needed some money. He collected glass bottles for a living. Four in the morning on a school day, we'd throw the glass bottles in the back of his van. And the bottles would break. And my hands and arms would start to bleed. And my tennis shoes and pants would get all bloody. And I was terrified and in pain. And I would stop working. And my uncle, he would look at me in the eyes, and he would say to me, (speaking Spanish). We're searching for a better life. We're trying to make something out of nothing. Mrs. Russ listened to my story, welcomed it into the classroom and said, Victor, this is your power. This is your potential. Your family, your culture, your community have taught you a hard work ethic, and you will use it to empower yourself in the academic world so you can come back and empower your community. With Mrs. Russ' help, I ended up returning to school. I even finished my credits on time and graduated with my class. RIOS: But Mrs. Russ said to me right before graduation, Victor, I'm so proud of you. I knew you could do it. And now it's time to go to college. RAZ: So clearly she recognized your potential. She saw that you had something. And then your life started to turn around. And then you decided that in your career you wanted to do the same thing for people who were like you. RIOS: Yes (laughter). So I study young people that have gotten in trouble with the law. I study young people that get in trouble at school. And I try to find practical solutions for how do we help these young people out? And as I do my research, I separately conduct mentoring programs. And now a hundred of my undergraduate students participate in those mentoring programs. RAZ: So basically, when we see young kids, particularly boys, who are - come from, you know, troubled backgrounds, they're described as at-risk kids. And you have a different way of - you're sort of pushing a different way of seeing this. So can you sort of talk a little bit about your vision for how we need to rethink kids who come from troubled backgrounds? RIOS: Yeah. So in many places in our society, when we deal with kids who are in trouble, we still use language that is deficit-based. So for example, you know at-risk kids - at-risk youth is one example. But labels are important. So if you label me a risk, your solutions for me are going to be risk-based. And I've been with kids in juvenile facilities. I've been with kids in detention rooms. I've been with kids on the streets. And I've told them, hey, you're not at risk. You're at promise. And when I tell them that, you know, they light up. They feel like, wow, really? You think that about me? And I say, yeah, I believe that about you. RAZ: Just take a small tweak like that, like just changing at-risk to at-promise and really kind of recalibrating the way we talk about certain kids can actually change not only how we think of them but the way they think of themselves. RIOS: Yes. And it's important to help to change the way young people think of themselves because many times, you know, they're in a vulnerable stage in their development. They're adolescents. They're already in turmoil. And then you add poverty. You add being labeled as a troublemaker to the equation. And so they are very much on the edge. And you bring them back in by making them feel like, hey, you have potential. You have promise. You're a leader. Let's bring it out. Where's your hidden genius? How can we bring that out in school and in society? RIOS: What do teachers like Mrs. Russ do to succeed with young people like the ones I study? I proposed three strategies. The first - let's get rid of our deficit perspective in education. These people come from a culture of violence, a culture of poverty. These people are at-risk. These people are truant. These people are empty containers for us to fill with knowledge. Number two, let's value the stories that young people bring to the school house. Their stories of overcoming unsurmountable odds are so powerful. And I know you know some of these stories. And, of course, the third strategy being the most important - resources. We have to provide adequate resources to young people. Grit alone isn't going to cut it. You can sit there and tell me all you want, hey, man, pick yourself up by the bootstraps. But if I was born without any straps on my boots, how am I supposed to pick myself up? RAZ: Do you think that - I mean, do you think that you were exceptional, that you were like - you had this hidden talent that was discovered? Or do you think that you just got lucky, that that there were lots of kids like you and you just got lucky? RIOS: Yeah. No. I don't consider myself a genius in any kind of way. I just - what I consider myself is someone that was given opportunity and that maybe was resourceful in taking advantage of that opportunity. I turned 40 recently. And instead of thinking of it as midlife, I think of it as double life because I wasn't supposed to live to age 20, and then I got an extra 20 years. And so I'm in a place where because of my teacher that came into my life and taught me that I did have that intelligence, that I did have that potential and helped me see it before I could ever imagine it, I'm here today. That's the common denominator in my life story, and that's the common denominator in the 10 years of research I've conducted with young people, that when you have a good figure in your life that is there to guide you, you have that potential to make it far. RAZ: Victor Rios - he's a professor of sociology at UC Santa Barbara. You can watch his full talk at ted.com. Transcript provided by NPR, Copyright NPR.